April is National Anxiety Month, and few things inspire more irrational fear and dread than visiting the dentist. Dental anxiety often develops in childhood. For some, a painful experience creates deep-rooted dental fear that results in a lifelong avoidance of the dentist. Others may be afraid of dentist drills or strange chemical smells. A recent study conducted by Delta Dental Plans found that parents can transfer their own dental fear to their children. Data collected revealed that the percentage of moms and dads who admitted to having a fear of dentists correlated perfectly with the number of children who had the same fear. Ways to Defeat Adult Dental Anxiety If you’re a parent, you can avoid passing along your fears to kids by maintaining a positive outlook toward dentistry and addressing your outdated dental fear. 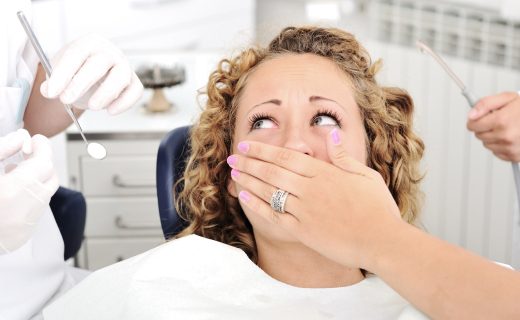 Here are five ways for adults to stop being afraid of dentist appointments.